Did you know that an overhead garage door can stay operational for as many as three decades? That is, provided that it receives proper care. You should consider some of the advice we offer here to learn how you can extend the longevity of your system. You should clean the panels twice a year - once in the spring and once in the fall. Steel panels require washing with a sponge. You can prepare the cleaning solution yourself, just dissolve one cup of liquid detergent into two gallons of water. Now rub the door gently with the sponge to remove the dirt. Once you're done, fill a bucket with fresh water, wash the sponge and rinse the panels. Rinsing is crucial for getting good results. A wooden door requires cleaning with a damp soft cloth. Microfiber cloths work best because they are lint-free. Wooden door panels require repainting once every year. Steel ones can be repainted less often. If the old paint starts peeling off, repainting will be required immediately. Before you do this, you need to inspect the door for damage. Watch out for signs of decay with wooden panels. This includes darker spots which are softer and crumble when touched gently. If you have a steel garage door, you should inspect them for rust. Even if the problem seems small, panel repair may be necessary. If the damage spreads, replacing the affected sections may be the only solution. The main role your garage door weatherstripping plays is to improve the insulation quality of the door and protect its components from outside weather; rain and snow, in particular. That is why you should check them for damage regularly. There is an easy way to do this. 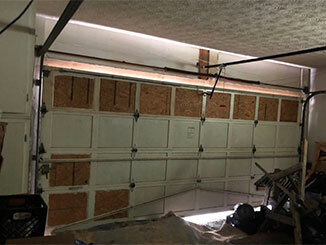 During the day, close your garage door without turning on the lights. If you see light coming through the top, bottom and/or sides of the door, then the weather strips there will need to be changed. If the bottom seal is attached to the door with the use of a retainer, it is very easy to replace it. This component is much more reliable compared to adhesives and nails. That is why you will benefit from getting an aluminum retainer installed. Contact our team at Garage Door Repair Trumbull if you need professional panel replacement.